I've decided to sit out 80's week on Project Sewn. At least I was able to participate in the first two weeks. Now that I've got that out of my system, I can let you know that I still plan to submit something for week 4. In the meantime I'll be catching up on a few other sewing projects, including summer clothes for the kids, baby gifts for the triplets, and maybe helping my sister with some mending and refashions. I have a bad habit of planning more than I actually have time to accomplish so don't be surprised if all I get done is the summer clothes. 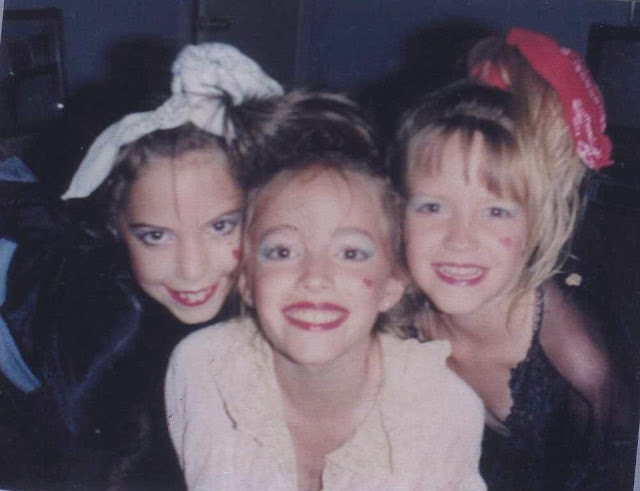 Finally, In honer of Project Sewn Inspired by the 80's week, here is a picture of me and two of my sisters in the 80's. My youngest sister wasn't born yet so you'll have to wait till someone does a 90's week to see her. Good Luck to all of the contestants and Sew Alongers! I can't wait to see what you all come up with! I've Got the Creativity, Now Give Me the Skills!